Most camping trips take place over a Bank Holiday weekend, which is often more convenient for anyone looking to be involved. On this occasion, we naturally ended up with a smaller turnout (twelve people, as my count; while I believe there was nineteen of us in Snowdonia a month ago). I’m also a terrible procrastinator [or an excellent one, depending on how you look at it], when it comes to anything that involves the terms ‘planning’ and/or ‘packing’. What’s most important is that I got there. I navigated the B-roads from Shepton Mallet without having to dig my SatNav out of the car boot. I took part in two walks (leading one), ate at the Saturday night barbecue and talked with a couple of group members I’d previously seen but not really spoken to. 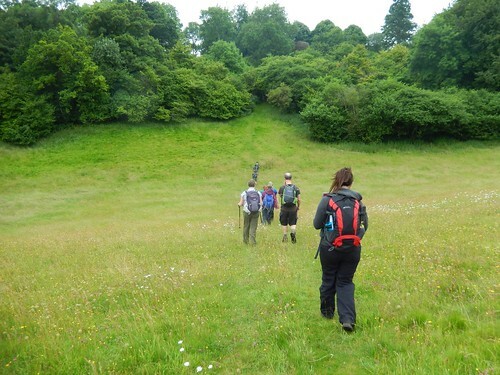 This was led by Matt; one of the 20s and 30s group’s more experienced walk leaders. Generally speaking, Matt leads a good walk. 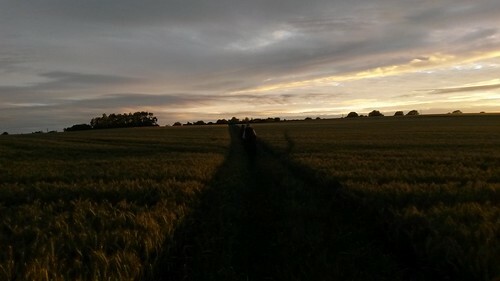 As I would, he’d also found it tricky to plot a circular route that would maintain interest, purely because the area isn’t as well-blessed with convenient footpaths as some may like. 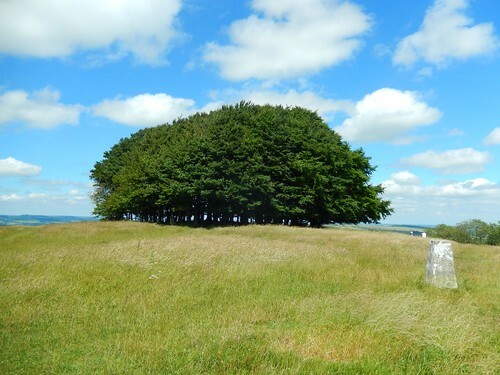 But we started at the generously-sized car park a few metres beneath Win Green, the highest point on or in Cranborne Chase. From there, we followed the Wessex Ridgeway south as far as Tollard Royal, where we stopped briefly beside a picturesque pond (and Matt disappeared to find a GeoCache). We continued through and across Rushmore Park golf course before heading in to the depths of Chase Woods. Our lunch stop was within these woods; a full dozen of us (and one dog) perched either side of a narrow right of way. 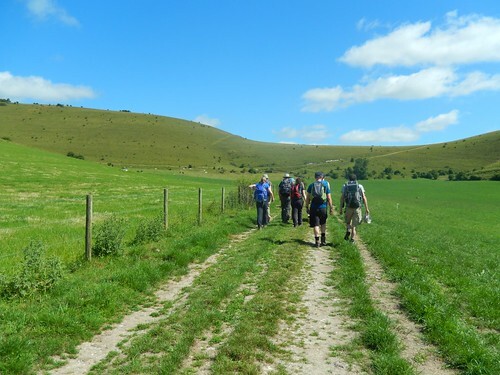 This is one of the ‘inconveniences’ of leading a walk in an unfamiliar area – you don’t know exactly what you’re going to find and picking the best lunch stop to suit the majority isn’t going to be more difficult than usual. After lunch, we climbed a byway up to Ox Drove – somewhere before all of this though, we all admired this folly tower construction. To me, it looks like it bears a Russian influence… In actual fact, it was built buy a millionaire owner of the Rushmore Estate in 2009! Ox Drove eventually led us back towards Win Green (277m above sea level), where we approached the summit of the hill (and its views) with a group of female Duke of Edinburgh expeditioners ahead of us. 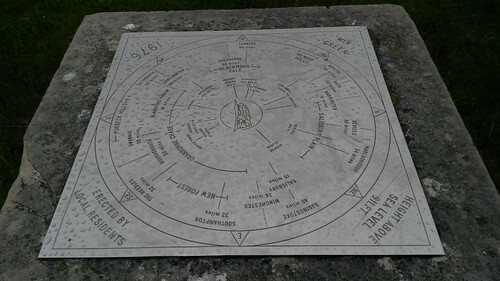 Along with the trig pillar, there’s a square-section topograph that details various high points and landscape features from the surrounding area. Some of the views from up here were superb. Still unkown to the rest of the group; as I’d arrived early, I’d already ‘bagged’ the summit and its trig point before anyone else had their boots on. It’s also fair to say that nobody was wearing a jacket by the time the walk ended. As our main twelve-mile walk had started and ended early, there was still time to kill before bed. 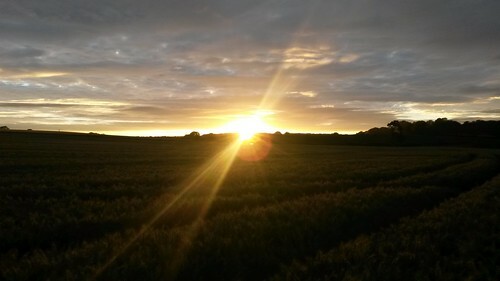 As the chill in the air steadily increased, a few of us joined Matt on a brief GeoCaching walk around Sixpenny Handley. 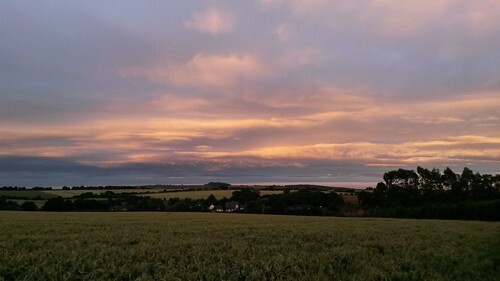 No-one will ever refer to me as ‘GeoCache Olly’ but I do appreciate a good sunset and, in my experience, the evening sky over Dorset often has the best cloud formations. 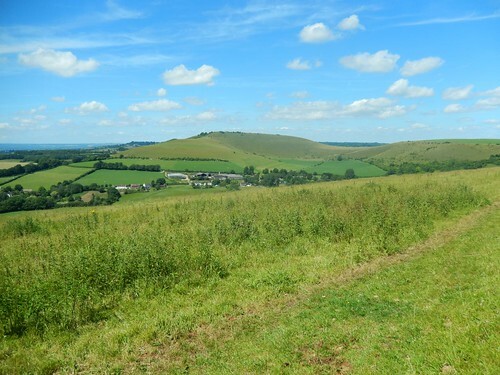 When I looked in to local places to go walking, Melbury Hill stood out as much as Win Hill as one of the key features of the local landscape. Plus, it was only a fifteen minute drive from Sixpenny Handley. 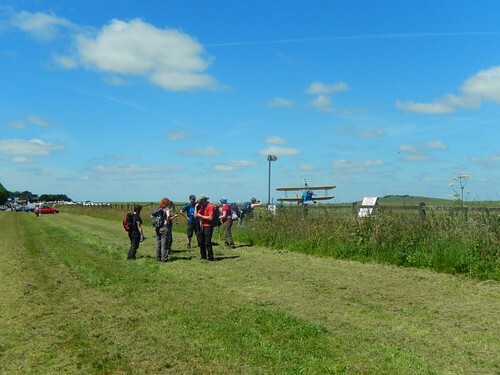 Our walk began from a layby off Spread Eagle Hill; a stone’s throw from the local airfield and we quite literally filled every last parking space available, sharing eight cars between us, on the day of departing the camp site. Many of us were staggered to find we were all packed up and ready to leave by 9:30am! A club record for a camping trip, perhaps? 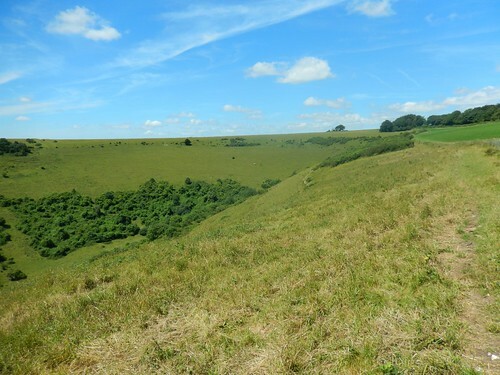 We descended towards Compton Abbas before beginning the long climb to the 263m high summit of Melbury Hill. 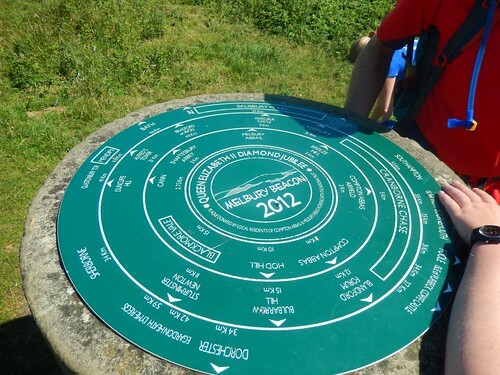 Like Win Green, Melbury Beacon has its own trig pillar. But the topograph is a circular stone slab stacked on top of the trig point… While I’m grateful for this, I’m also feel saddened towards the decision to plant it right there. Views from up here were truly panoramic, with no clump of trees to interfere. 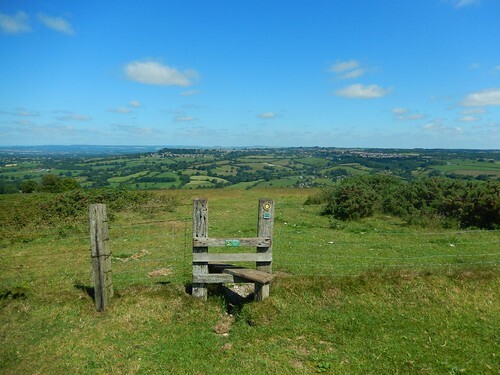 To the north, you can clearly see the Saxon town of Shaftesbury, spread along the hill top. 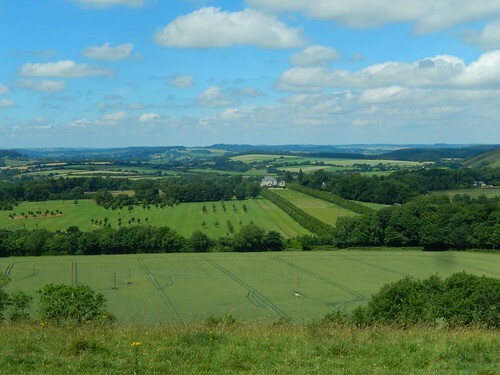 From this pleasant summit where, we met less than a handful of other people and dogs; our walk continued east before turning south east, as we followed the right of way across Compton Abbas Airfield… Or, at least, tried to. While there was a footpath sign pointing the correct way and I was confident in my ability to lead us to the next stile, even without a worn path along the ground ahead of us; I did not translate this well across the group, as a number of people ran hurriedly across the vacant airfield, while the rest of us strolled along and laughed. No lives or limbs were lost. Only photographs were taken. But do not attempt this across the runway of a large airport as you will probably be arrested by an Airside Security Unit. 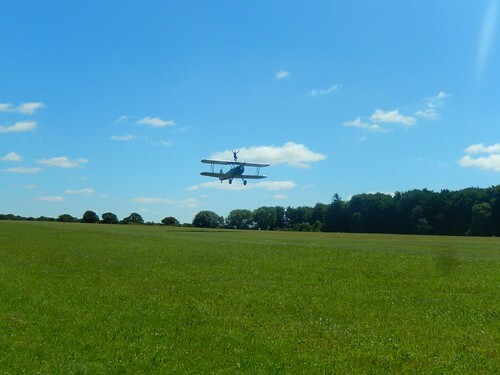 At Compton Abbas Airfield, there is a telephone number you can call, should you feel in any doubt about crossing the field. Wing-walking looks kind of fun and, with pilots flying over our heads several times, it’s hopefully an experience that will live within the minds of the others for many years. We descended through West Wood; climbed up from Shepherd’s Bottom and followed the road south-west to Fontmell Wood. We endured an awkward, bug-infested lunch in the heart of these woods before eventually crossing Spread Eagle Hill road for a second time. 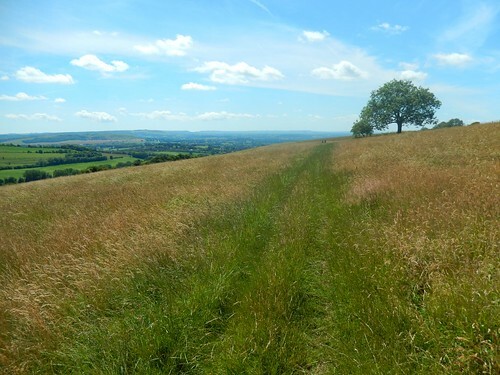 From which, I was delighted and relieved to find a footpath (not featured on the map) leading us north and on to the Open Access Land of Fontmell Down through its nature reserve. Cracking views once more, as we maintained our height above the valley of Longcombe Bottom. Had we not been able to access this land so conveniently, it would’ve meant leading a group of twelve up and along what appeared to be a very busy road on this Sunday, with temperatures rising to around 22°C. 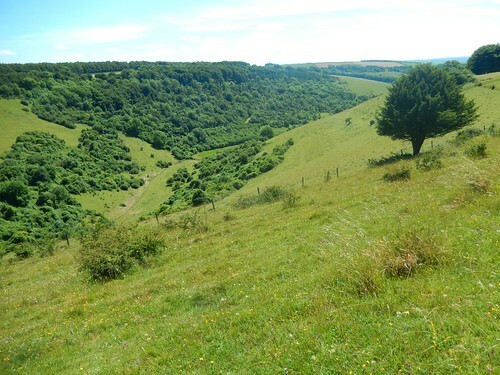 I successfully led us on an anti-clockwise loop around the head of this downland to take a direct route back to the cars, where I’d previously intended to drop down to Compton Abbas and climb back up the way we’d begun. For me, this weekend was short-lived but highly enjoyable. 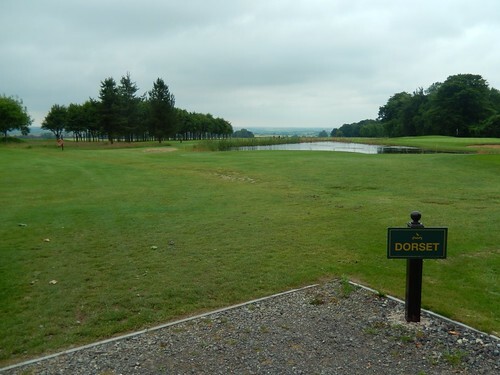 I must admit, I wasn’t keen on exploring Cranborne Chase when I first heard the announcement (for starters, I’d mistaken it for Cannock Chase…). 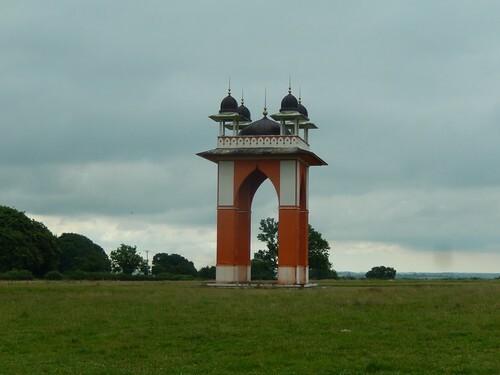 It didn’t have any mountains and it’s highest point is less than that of the (my) Mendip Hills. 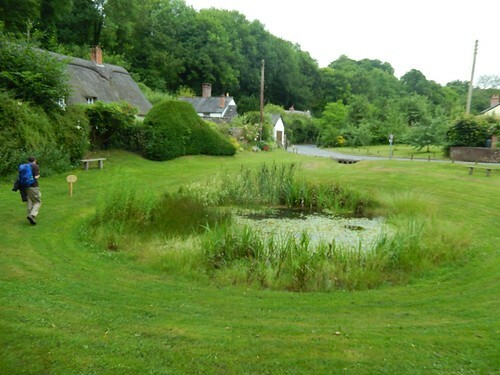 But there I was; discovering a beautiful part of Dorset a good hour’s drive north of the much-sought-after Jurassic Coast. Mostly, I was keen to go on another group camping weekend, after reaping the benefits of the late May Bank Holiday weekend. Plus, it was a comparatively short drive from home. I accidentally drafted this on my other site and I’ve not yet figured out a way of easily moving it over so, here I am, Reblogging my own work!